I have a ton of things to do before I send my daughter back to school tomorrow. So why did I spend my weekend driving up and down the Central Valley? It started back in April, when we celebrated Megan’s birthday. My sister’s gift was a ticket to a concert featuring one of my kid’s favorite bands, the Irish group The Script. There was just one hitch: The concert was being held on August 10, the Saturday before the start of school. In Sacramento. This is where my sister and her family live. …and you would be wrong, because that’s not how I roll. But back in April, we did not think a quick trip up to Sacramento and back the weekend before the start of school would be that big a deal. The worst case scenario might include us just sending Megan up and down on Southwest, which would free us up to take care of whatever we needed to do on the weekend. We had lots of time to decide how to handle it, so we waited until we were closer to the date. And then in June, our niece (one of the ones in Sacramento) graduated from high school, and her brother took a page from his mom’s book and gifted her with a ticket to see the band, Train, on August 9. “It’s in LA,” he told her, and the plan was that he and she would drive down here together to see the show. Here’s the funny part: The Script concert and the Train concert were both the same show, because the Script was opening for Train. My daughter and niece didn’t mind. They thought it would be great fun to follow the band from here to there and see the same show two nights in a row. At some point in this discussion, we realized that the concert in LA on Friday night was actually in Irvine. People who don’t live here tend to lump all of Southern California into a label called “Los Angeles,” but it’s quite a distance from our home in the San Fernando Valley down to the Irvine Amphitheatre, and that distance tends to be crammed with bumper-to-bumper traffic. But hey — this was going to be special. We could deal with it. Then my nephew wound embarking to Israel on August 7, so he was not able to accompany her. So the new plan involved my sister and niece somehow arriving here on Friday so the girls could attend the show (while the parents enjoyed a nice dinner out), and then Megan would go up to Sacramento with them and then we would get her home to us somehow on Sunday, perhaps on a plane but maybe I would drive or maybe my husband would, too. We had time to figure it out. By last week, we had still not figured it out. My niece had taken a part-time job and she was scheduled to work on Saturday night (which was when she was supposed to see the concert with my daughter in Sacramento). There was a chance that she could switch hours with a co-worker, which meant she would work on Friday instead (the night of the tickets her brother gave her). In that case, they would send the Friday night tickets to us, Megan could take a friend to Irvine, and then we would have to get her to Sacramento on Saturday for the second show. And since we hadn’t really dealt with this until now, airline tickets were pretty much out of the question. One or both parents were going to have to drive. “We can all see the show together,” my sister announced. That may have been in the back of her head all along: the ticket she gave my daughter for her birthday was one of a set of six. “We saw Train at a convention a few years ago and we really liked them,” my sister explained on Friday after I met her and Maddy at the Santa Clarita Amtrak dropoff on Friday afternoon. It was about 2:30. We had just enough time to drop their bags off at home, pick up a blanket and bottled water (my nephew had gifted his sister with lawn tickets) and head down to Irvine. We expected to get there early, which would allow us to scope out the area and figure out where to pick the girls up when the show was over. It took us over two hours to get there. But our plan was good: The parking lot was just opening and we arrived among just a few folks who had come to do a little tailgating before the show. The parking attendants pointed out the best spot for drop-off and pickup. We learned that it was OK to bring food in to the show, so we decided to search for a Subway. The nearest one turned out to be at the Irvine Spectrum, a mall that was just a couple of blocks away from the Amphitheatre. We dropped the girls off and debated where to have dinner. We tried to estimate how long we had: The show was scheduled to start at 7:00, but likely wouldn’t begin right on time. 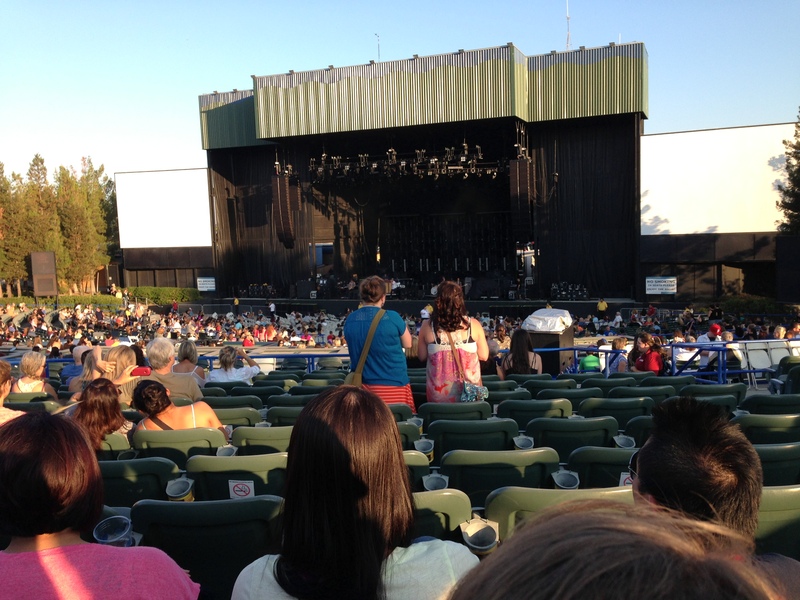 There were three acts (Gavin DeGraw was set to start before The Script)… We would want to be back at the Amphitheatre at least a half hour before the show ended. We figured we had three hours to kill. …or we could stay close by and have a relaxed dinner at one of the restaurants in the mall. What do YOU think a couple of Jewish mothers would choose to do? Of course, we stayed close to our kids. We ended up having a really wonderful dinner at Paul Martin’s, one of a chain of American bistro-type restaurants owned by the same guy behind PF Chang’s and Fleming’s Steakhouse (you see, the guy’s name is Paul Martin Fleming). We stretched that dinner out with drinks, appetizers and dessert. It was all really, really good. We texted them back with our location back at the Amphitheatre parking lot and drove back to my house, making it back at 11:30. This was a good thing, because Maddy’s shift on Saturday began at 2:00 p.m., which meant we needed to be on the road the next morning by 6:00. My sister decided not to go on Saturday night. She didn’t want Maddy to come home from work to an empty house (Jewish mother, remember? ), so she told her eldest daughter to invite one of her friends. So here’s the thing: There was a time when I was passionate about music. My dream was to be a writer for Rolling Stone, like Cameron Crowe. I got kind of close: My first job out of college was writing (and later producing) a nationally syndicated weekly Top 30 countdown show for the RKO Radio network (among others). Basically, I interviewed rock stars for a living and got to attend two or three concerts every week — for free. That experience made it hard for me to justify paying hard-earned money for the crummy seats I could actually afford to buy, so I stopped going to concerts. And I wasn’t all that interested in going to this one. The only act I was familiar with was the Script, who remind me a little bit of U2 before they got huge. It’s not just that both bands are from Dublin: I think the Script’s rich sound and the quality of their songs make them a band to watch. The truth is, as I’ve gotten older I’ve become more and more curmudgeonly. I dislike crowds. I don’t want to deal with the parking. And I hate being the oldest person in the room. I told my sister I would be OK with keeping her company at home. My husband, however, didn’t want to hear that. He wanted me there. So I did. And I had fun. It helped noticing that I wasn’t the only old fogie in the multi-generational audience. And the show was really good, with the three acts very well-matched. I decided that I really like Gavin DeGraw, who was funny and charming and seemed to be having a really good time with the audience. I learned that I was familiar with some of Train’s hit songs, but didn’t like them enough to bother to learn the name of the group that performed them. It surprised me to see how popular they were with the audience, who were singing along as if they were the second coming of Springsteen. I felt like I do when I go to church with my husband and pretend to be familiar with the hymns everyone else is singing. I ended up deciding that the cult of Train is like Jimmy Buffet’s Parrotheads. I never got into Buffet’s music, but I cannot deny that a lot of other people find it appealing. But the bottom line is: it was worth it. The whole shebang — from the ordeal of driving to Orange County in rush hour to getting up at the crack of dawn to drive to Sacramento, and then doing the same drive back home the following day. This is something I had remind myself yesterday as we sped along I-5 for our second six-hour drive in 36 hours. And now: School starts tomorrow and I’ve got a lot to do.